Hartridge Common and Hense Moor are located to the north of the East Devon town of Honiton. The panorama above clearly illustrates how agricultural improvement has encroached on what must once have been vast tracts of heathland. All that remains of these extensive areas of heathland are isolated patches such as Hartridge Common and Hense Moor. Hartridge Common is a dry lowland heath habitat which runs along the top of a ridge above a south-facing valley. It is characterised by large expanses of Bracken (Pteridium aquilinum) and characteristic heathland grasses such as Bristle Bent (Agrostis curtisii). Ling (Calluna vulgaris), Bell Heather (Erica cinerea) and Bilberry (Vaccinium myrtilis) are all present. 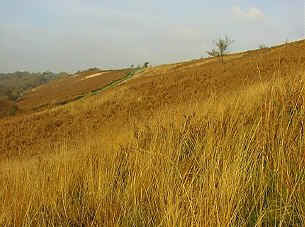 The Common is bounded on the crest of the ridge by improved agricultural land. 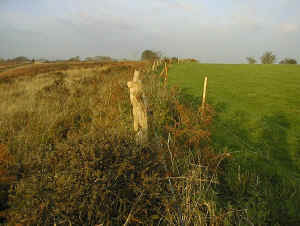 The right-hand picture shows clearly the impact of modern agriculture on heathlands, with the improved grassland in stark contrast to the remaining moorland vegetation on the left of the fence. The Common is managed by a committee of Commoners.